Hundreds of students, staff and faculty stopped by Mott Lawn April 27 for Cal Poly’s first-ever Day of Kindness. 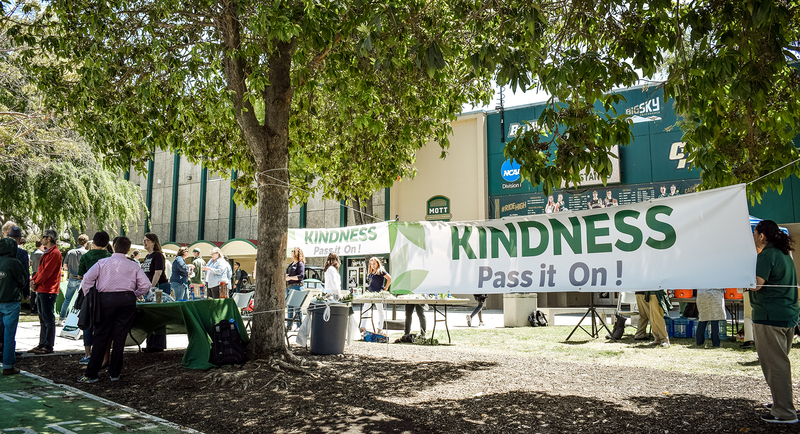 “Cal Poly [Day of] Kindness event was planned so that, as a campus, we have opportunity to come together and pause and share in the spirit of kindness as part of our everyday,” event coordinator and Student Affairs Director of Organizational Learning Carole Schaffer said. 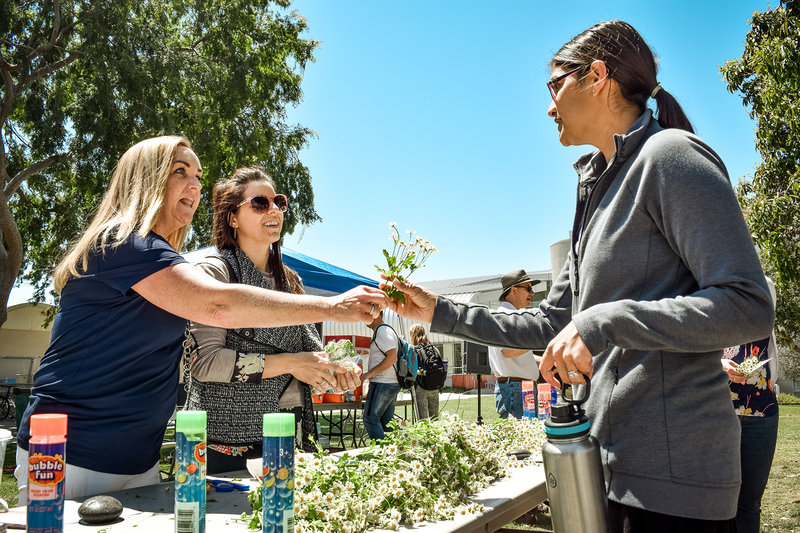 “Come Together” by the Beatles echoed out of speakers as students, faculty and staff passed out daisies and KIND bars to people who passed by Mott Lawn as a way to spread positivity. The university-sponsored event featured booths from different campus organizations. Mustangs United, a group born out of the Office of University Diversity and Inclusion with the motto “Love, Empathy, Respect,” was present at the event, along with Inter Housing Council and Student Affairs. Some students, faculty and staff said the event counteracted the tense campus climate that left many students feeling isolated. The night prior, students, protesters and heavy security occupied the same space for the return of controversial conservative speaker Milo Yiannopoulos. Animal science junior Teresa Marcial was walking to the Recreation Center when she came across the “Kindness” sign in front of Mott Lawn. She decided to take a break, sit down and paint rocks with other students and faculty members. Mathematics professor Stan Yoshinobu, who advocates for the “Love, Empathy, Respect” motto, said he hopes this event will help students understand that all students belong at Cal Poly. Yoshinobu said moral success is just as important as academic success at Cal Poly and given recent events, everyone needs to be reminded of the importance of kindness. The event was an opportunity for students and faculty to come together and practice kindness. Alice Tomasini, a lecturer in the School of Education, painted rocks with fellow faculty members and considered the need for a Day of Kindness. She said she has seen kindness, empathy and inclusion in her students, and she hopes the negative actions of some students do not drown out the kindness she has seen on campus. Schaffer said this will be the first of many Days of Kindness. The next Day of Kindness will be in May as a part of Wellness Month.